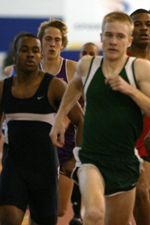 The 2008 Montgomery Invitational started off auspiciously for Montgomery County athletes. Victories from the B-CC boys and Churchill girls in the 3200-meter relays set the tone for what would be the most successful meet for Montgomery County teams in the history of the meet. 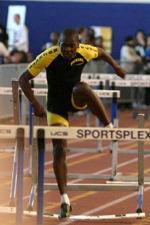 With so many elite athletes coming from near and far, MoCo is usually lucky to get one or two athletes or relays who win an event, but in 2008, MoCo brought home 8 golds, indicating the progress of Montgomery County in the past few years. The boys 4x800 meter relay opened up with Dover taking a big lead over B-CC's Dylan Straughan. Straughan ran smart and did not get carried away with the earlier pace. He kept the race within reach for his teammate, Alex Prevost. Prevost worked his way up to the front for B-CC with a 2:01 split before handing off to Kyle Short still in 2nd. Short caught the leader from Dover and built the lead before handing off to Walter Beller-Morales. Meanwhile, the Dover runner faded badly and tripped right before the handoff. On the ground several feet in front of his teammate, the Dover runner reached out to handoff the baton but could not reach. He struggled to get up, but finally made it to his feet just long enough to make the exchange. This gave Beller-Morales of B-CC a much needed lead. Dover's anchor ran a strong leg to make up some ground, but Beller-Morales ran a strong leg to close it out for B-CC in 8:19.35. Morgane Gay of Whitman led the field in the 4x8 through the first leg with Largo and Churchill not far behind. Churchill's Owoade Ayorinde took over the lead on the 2nd leg, putting a big gap between herself and Whitman's Tessa Morrison. Louise Hannallah further built the lead over Whitman and Largo on the 3rd leg. It was the all-to-familiar scene where Churchill had the lead before Leslie Morrison of Whitman hunts them down for the win�but this year was different. Churchill had about a 60 meter lead over Whitman and a very strong anchor leg themselves. This year proved to be very different from previous years as a victory was never within reach for Whitman on the final leg. Erin McManus anchored in 2:20 for the new meet record time of 9:34.10. Following the 55-meter dash and hurdle trials, the pace of the fast-moving Montgomery Invitational suddenly slowed down. The people began to get quiet. Runners stopped their cool-downs and spectators dropped their hot dogs and donuts. Suspense began to mount as everybody could feel the angst rising from the track. This is because the participants of the Boys Invitational Mile, a qualifier for the famed Millrose Mile in Madison Square Garden, were lining up on the starting line. The competition in this race amounted to national proportions and earned the national coverage it deserved. 15 runners from as far south as southern Virginia all the way up through Pennsylvania ventured to the PG Sportsplex to try and contend for a victory against the best milers of the East Coast. Peter Dorrell, a senior from Blacksburg, Virginia, and Georgetown Prep's Ramsey Chapin took the race out in a controlled pace. TJ Hobart, a 4:12 miler from Baldwin High School in Pennsylvania, followed right behind them. The rest of the field followed the pace until the end of the first lap. Dorrell took sole possession of the lead after the first lap in a 64, right on record pace. Chapin fell back, and Hobart stayed in third. Marc Dennin, former teammate of Millrose Mile winner and Montgomery Invite Mile runner-up Jason Weller, moved into second. At the half-way point, Dorrell still led, followed by Dennin and Hobart. With two runners who have already run 4:15 or better during outdoor track and another who is very capable of eclipsing the 4:20 mark, the race once again appeared as if it would live up to its potential for a fast, tight finish. But with 400 to go, Dorrell began pulling away and finished in 4:16.81, a new meet record. Most impressive of Dorrell's victory was his ability to accomplish this feat the very hard way: wire to wire. Joe Lorusso, a senior from Oakton, Virginia moved into second place with 50 meters left and finished in 4:17.83. Logan Collins of Orange County, Virginia, who had been around or up with the front runners the entire race, could not answer Lorusso's kick. Collins finished in third in 4:18.55. The eager audience never saw a lead change throughout the entire boys mile, but the girls mile would be a totally different story. Any discontent remaining in the crowd would be remedied by a fast-paced, hard-fought, unpredictable girls race that would not be decided until the very last instant. Osbourne Park's Ariel Karabinus ensured a fast pace early on by taking the lead. Fellow Virginia runner Lia DiValentin from Chantilly joined her up front. After a quarter mile, the pair from Virginia pulled away from the pack, which was only answered by the freshman from B-CC, Alex Doll. With little racing experience, Doll's strategy was questionable, but she stuck close to the two All-Mets from VA.
At the halfway mark, Amanda Lineberry of Lee-Davis pulled up on the pack, threatening to pass anyone who faded. 1000 meters into the race, Doll moved into the lead. Karabinus attempted to pass back, but could not. With just a quarter mile to go, the runner with the fastest PR, Morgane Gay of Whitman, finally woke up after lagging near the back for half the race. Gay surged past Lineberry and DiValentin over the 7th lap and broke apart Karabinus and Doll as the bell rang for the final lap. Running at top speed, Doll refused to give in to Gay's furious kick and reopened a small gap. Coming down the final 50 meters, Gay put in another surge, a gear that Doll did not have. Doll had a one-stride lead through 1600 meters, but coming across the mile finish line, Gay leaned forward as Doll stood upright, and that made the difference. Gay won in 5:08.48 over Doll in 5:08.53. The mile action didn't stop there. The 1600's were up next and just like in cross country season, it was B-CC and Quince Orchard leading the way for MoCo. Prevost came away with the best time with a PR of 4:31.62. In the same heat, Straughan finished in 4:33.70. In the final heat, Joson and Laratta of QO ran tough against a very strong field of runners who missed qualifying for the invitational mile. Laratta finished in 4:32.13. Joson was a few meters back. Britt Eckerstrom of Northwest won the girls 1600 with an exciting finish in 5:19.22. It's always good to see MoCo athlete in the dash and hurdle finals, especially when they are favored to win. Tyler Jackson of RM came out of the prelims with the top time, but Jackson Jordan of Mt. Hebron, formerly of Poolesville, got off to a great start and got the win 7.69 over Jackson's 7.74. Gary Frazier of RM made it to the 55-meter dash finals and finished 3rd in 6.59. The seeding of the boys 400's was interesting, but Montgomery County made the best of it. Almost every heat had one of MoCo's best, in no particular order. 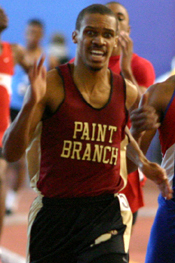 Antonio Palmer of Gaithersburg won the first heat in a time of 51.88 which held up as the top time until 9 heats later. 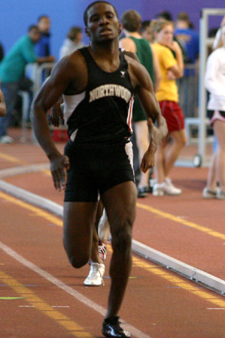 A MoCo athlete won out of heats 1, 8, 10, 11, and 12 including Derrick Powell of Northwood who won the entire event out of heat 11 in 50.69. The girls were almost as strong in the 400, with three girls under 60 seconds. Alissa Jewell of Gaithersburg placed 2nd in the heat in 59.78. Arielle Statham of Paint Branch won her heat in 58.66, which placed her 3rd overall. Katie Wolf of Churchill placed 4th in the toughest heat in 59.99. An early heat of the 800 saw a breakthrough performance from Quince Orchard's Wayne Bartholomew. Bartholomew was chased by Blair's Nilan Schnure the entire race, but refused to lose. 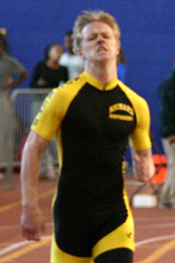 Bartholomew won that heat in a time of 2:01.47, which held up for 4th overall. Antonio Palmer was back from his 400 to challenge a fresher Wil Zahorodny in the final heat of the 800. As fate would have it, the second half of the race unfolded into another battle between the two. Zahorodny had a slim lead over Palmer the entire way. Eric Hoepker of Battlefield put in a late surge to move past Palmer, but Palmer shook him off. Palmer tried to out-kick Zahorodny in the final stretch, but he could not match Zahorodny's own kick. Zahorodny won in 1:59.50. Palmer was 2nd in 2:00.33. The girls 800 saw a few MoCo winners out of earlier heats. Becca Stinner (2:26.98) and Erin McManus (2:23.97) won the heats leading up to the final heat with times that would hold up to place in the top 5, but just how high they would finish depended on the final heat. The final heat of the girls 800 went out strangely slow. Leslie Morrison was the heavy favorite, but sat in the pack until there was one lap to go. Coming down the final stretch, she had a comfortable gap on the field, but the clock ticked up over 2:20. She finished first in that heat in 2:24.89, a time that was bested earlier by McManus. The Invitational 3200 was a true test for WJ's Brian Graves who had a breakthrough performance at the Southern MD Invite a week earlier. The field consisted of two footlocker national finalists and several other athletes who had run sub-10 before. Coming off a 4th place finish in the mile Mark Dennin maintained a huge gap on the field for the entire race. Mountain View's Thomas Porter attempted to go with him early on, but would later pay the price. Graves negative split the race and had plenty of energy to move by Porter on his way to a 2nd place performance in 9:49. Similarly, Meghan Lutz came down from PA and ran away from the girls 3200 field. The pack held close for the first half of the race, but she broke it open in the 2nd half. Only Louise Hannallah of Churchill was able to work her way back up as Lutz lost some energy in the final laps. Lutz was first in 11:17. Hannallah was 2nd in 11:23. WJ girls showed great improvement from earlier this season with a 4x200 finish in 1:50.13 (11th). The Churchill girls followed up their 4x800 win with a county best time in the 4x4 of 4:15.04 (7th). With Blair's Louis Varella sitting out for a meet, RM took away the fastest MoCo time in the 4x2 in 1:33.68 (4th), while Good Counsel had the top county time in the 4x4 with a 3:32.77 (4th). Quince Orchard put on a show in the boys DMR with a very fast overall time of 10:37.17. David Laratta led off and got all that he could handle from Oakton's Joe Lorusso. Laratta came through his 1200 split in 3:14 and handed off to Bartholomew. Bartholomew took over the lead from Oakton on the 400 leg with a split of 51.5. 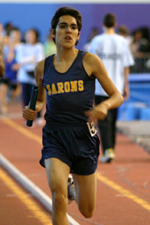 Joson maintained the lead with his 2:03 800 split. The three runners stood on the edge of the track watching Neal Darmody run lap after lap, attempting to do the math. Would sub-10:30 be possible? Maybe if they cheered hard enough for their teammate. Laratta reminded Darmody several times that he needed to run like hell so they could run the DMR at Penn. Darmody maintained a comfortable lead over the field, but despite his efforts, the clock struck 10:30 as he was rounding the final curve. His 4:27 1600 split earned them a time a 10:37.17, 3 seconds under the Penn Relays qualifying time (this does not gaurantee them a spot). The most noteable performance out of the field came from Gaithesburg's Sean Stanley who set a new personal best in the shot put. His throw of 56-01 is the longest throw by a Montgomery County athlete since results started going on the internet atleast ten years ago. Unfortunately, there was a 58-foot thrower from PA there to spoil his accomplishment. He settled for 2nd place. qo for the win at nationals dmr, anyone? Fixed it. And I adjusted QO's DMR splits to add up a little closer.